Sitting in the tower, nicely hidden from the rabble down below, you crouch and switch from rocket-launcher to rail-gun. There he sits, carelessly out in the open. A big fat juicy n00b target ready to be painted and fragged. Oh, how sweet. You can barely contain your excitement as you zoom your scope. Carefully adjusting your aim, you go for the headshot and slam your finger down on the left-mouse button. The shot goes wild! In the excitement of the kill, your enthusiastic mouse-click caused your hand to jerk. Suddenly, you find yourself alone and vulnerable with dozens of rockets flying towards your position. Weak. Pads: 2 (7? x 4? x ??) 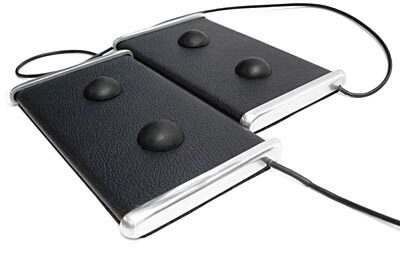 sleek low-profile wrapped polycarbonate pads with CNC aluminum end caps host two tough membrane switch buttons each and can be positioned individually for optimum ergonomic ease of use. 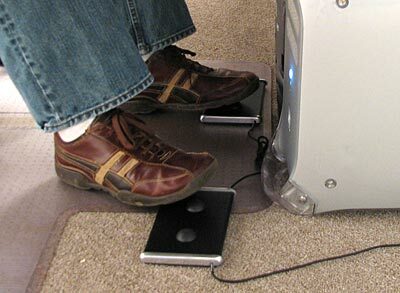 Non-skid rubber base keeps pads in place on flooring or carpet. Toggle ? Send one command on odd presses and another on the even presses. Converts game commands that require a button or key to be held down to a single tap. Timed Multi-Use ? Microprocessor timing of button presses enables a different command to be sent on a single click or tap, a double click, or normal press. That?s 3 different commands from the same single button! Shift ? Pressing a Shift button ?shifts? the 3 other buttons to a second function, adding 3 additional control options. Integrated Keyboard - Just like its mate the R2 gaming mouse, the Fragpedal contains the capability of a full-function PC keyboard with four modifier keys and 6-key rollover. Embedded Intelligence and Memory ? An embedded Cypress Encore microprocessor running PAL 2.0 a gives the Fragpedal powerful macro capability without disc based software, and a 32KB memory chip internally stores and accesses up to 30 different configuration settings for individually customized use with a variety of games and applications. No special drivers required ? GWS intelligent device? technology allows the Fragpedal to plug and play and just work with full capability as programmed. Compatible with Mac OSX, Linux, and all versions of Windows including Vista. A software application (Configuration Utility ver. 1.05.07) is included for programming the Fragpedal but is not needed for operation. Fully compatible with the R2 gaming mouse ? Shares PAL 2.0 technology, programming, macros and more.